I was having a hard time deciding what to bring to the New Year’s Eve party, when suddenly it became so clear. Just put liquor in everything! I primarily drink vodka, and didn’t want to have to buy very many ingredients; so I decided to make vodka balls! When I got home I remembered that I did have a little bit of coffee flavored rum, so I made two different flavors (that is why the ingredient list below will seem odd- it’s actually two slightly different recipes in one). Then get out two large bowls. Pour half of the cookie crumbs and half of the nuts in each bowl. Add half a cup of powdered sugar to each bowl, and 1 T of cocoa powder to one bowl (this will be the rum ball bowl). The remaining powdered sugar and cocoa powder is for rolling the balls in at the end. Stir the dry ingredients in each bowl until well mixed. When the dry ingredients are combined, and 1 T real maple syrup to each bowl. Add the coffee rum to the rum ball bowl (the one with the cocoa powder) and the vodka to the other bowl. Combine wet and dry ingredients. Then put both bowls in the refrigerator for 30-45 minutes. This allows the flavors to meld and the consistency to set a bit. When the mixtures are done refrigerating, form them into balls (mine are about an inch, but do whatever you want). Split the remaining powdered sugar into two bowls, and add the remaining cocoa powder to one bowl and stir to get chocolate powdered sugar. 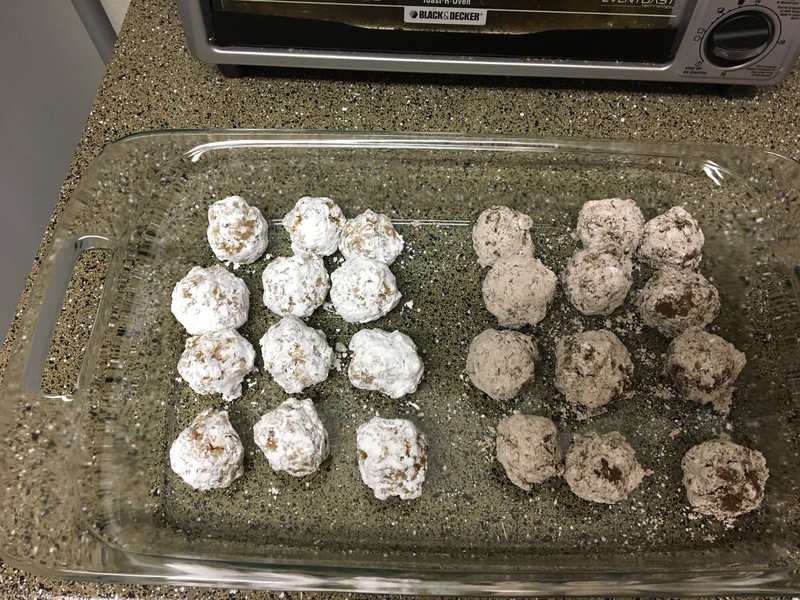 Roll each ball in the sugar (rum balls in the chocolate, vodka balls in the plain). Refrigerate until ready to serve, and cover tightly so they don’t dry out. That’s it, you’re done! I’m told they get more flavorful if they sit overnight or even for two nights. I wouldn’t know. Mmmmmm. I ended up with 24 balls. I probably ate at least two worth of dough while prepping, so there’s that. What kind of alcoholic snacks have you made? I want more snack ideas!